↑ 1.00 1.01 1.02 1.03 1.04 1.05 1.06 1.07 1.08 1.09 1.10 1.11 1.12 1.13 1.14 1.15 "Syphilis - CDC Fact Sheet (Detailed)". CDC. 2 November 2015. Archived from the original on 6 February 2016. สืบค้นเมื่อ 3 February 2016. ↑ 2.0 2.1 2.2 2.3 2.4 2.5 2.6 "Syphilis". CDC. 4 June 2015. Archived from the original on 21 February 2016. สืบค้นเมื่อ 3 February 2016. ↑ 3.0 3.1 GBD 2015 Disease and Injury Incidence and Prevalence, Collaborators. (8 October 2016). "Global, regional, and national incidence, prevalence, and years lived with disability for 310 diseases and injuries, 1990-2015: a systematic analysis for the Global Burden of Disease Study 2015". Lancet. 388 (10053): 1545–1602. PMID 27733282. ↑ 4.0 4.1 GBD 2015 Mortality and Causes of Death, Collaborators. (8 October 2016). "Global, regional, and national life expectancy, all-cause mortality, and cause-specific mortality for 249 causes of death, 1980-2015: a systematic analysis for the Global Burden of Disease Study 2015". Lancet. 388 (10053): 1459–1544. PMID 27733281. ↑ 6.0 6.1 6.2 6.3 Kent ME, Romanelli F (February 2008). 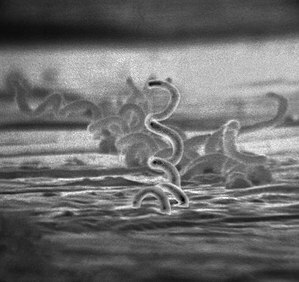 "Reexamining syphilis: an update on epidemiology, clinical manifestations, and management". Annals of Pharmacotherapy. 42 (2): 226–36. doi:10.1345/aph.1K086. PMID 18212261. ↑ Woods CR (June 2009). "Congenital syphilis-persisting pestilence". Pediatr. Infect. Dis. J. 28 (6): 536–7. doi:10.1097/INF.0b013e3181ac8a69. PMID 19483520. ↑ Newman, L; Rowley, J; Vander Hoorn, S; Wijesooriya, NS; Unemo, M; Low, N; Stevens, G; Gottlieb, S; Kiarie, J; Temmerman, M (2015). "Global Estimates of the Prevalence and Incidence of Four Curable Sexually Transmitted Infections in 2012 Based on Systematic Review and Global Reporting". PLOS ONE. 10 (12): e0143304. doi:10.1371/journal.pone.0143304. PMC 4672879. PMID 26646541. ↑ Lozano, R (15 December 2012). "Global and regional mortality from 235 causes of death for 20 age groups in 1990 and 2010: a systematic analysis for the Global Burden of Disease Study 2010". Lancet. 380 (9859): 2095–128. doi:10.1016/S0140-6736(12)61728-0. hdl:10536/DRO/DU:30050819. PMID 23245604. ↑ Franzen, C (December 2008). "Syphilis in composers and musicians--Mozart, Beethoven, Paganini, Schubert, Schumann, Smetana". European Journal of Clinical Microbiology & Infectious Diseases. 27 (12): 1151–7. doi:10.1007/s10096-008-0571-x. PMID 18592279. ↑ Coffin, L. S.; Newberry, A.; Hagan, H.; Cleland, C. M.; Des Jarlais, D. C.; Perlman, D. C. (January 2010). "Syphilis in Drug Users in Low and Middle Income Countries". The International journal on drug policy. 21 (1): 20–7. doi:10.1016/j.drugpo.2009.02.008. PMC 2790553. PMID 19361976. ↑ Gao, L; Zhang, L; Jin, Q (September 2009). "Meta-analysis: prevalence of HIV infection and syphilis among MSM in China". Sexually transmitted infections. 85 (5): 354–8. doi:10.1136/sti.2008.034702. PMID 19351623. ↑ Karp, G; Schlaeffer, F; Jotkowitz, A; Riesenberg, K (January 2009). "Syphilis and HIV co-infection". European Journal of Internal Medicine. 20 (1): 9–13. doi:10.1016/j.ejim.2008.04.002. PMID 19237085. ↑ "WHO validates elimination of mother-to-child transmission of HIV and syphilis in Cuba". WHO. 30 June 2015. Archived from the original on 4 September 2015. สืบค้นเมื่อ 30 August 2015. หน้านี้แก้ไขล่าสุดเมื่อวันที่ 13 ธันวาคม 2560 เวลา 01:43 น.